Many organizations have bylaws stating that a majority vote (i.e. >50% of the total submitted votes) must be reached by a candidate for them to be elected to a position. In the event that a majority is not reached by any of the candidates, runoff elections are performed to determine a winner. You will be brought into the "Details" stage of the new election you've just created via duplication. First, check the election title and remove the "Duplicate of" from the title. Edit your start/end dates and times (tip: you can type "now" into the start time to have the election launch as soon as you click "Start Election" on the "Review" page). Scroll to the bottom of the "Details" page and click "Save and Continue to Ballot Design". Scroll down and click "Proceed to Voter Notice". You will not have to make any changes to the "Notice" page. You can scroll down and click "Continue to Voter List". Scroll down and click "Continue to Review". 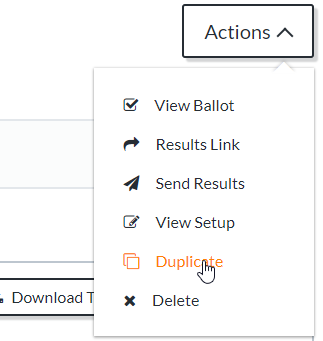 On the Review page, proceed through the four Review steps (testing the ballot, confirming the voter list, verifying election details, and agreeing to the terms and conditions). Click "Start Election" or "Proceed to payment" to get the election going!